Are you looking for a Locksmith in Southampton? 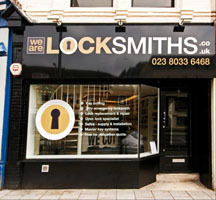 Well you have come to the right place, We are Locksmiths are a leading Locksmith based in London Road, Southampton. 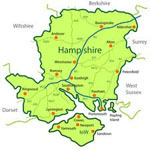 We cover all of Hampshire with our on site and emergency locksmith services. Although established in early 2011 we have a wealth of knowledge in our team of qualified master locksmiths, with our head locksmith having over 15 years of experience. Our team of Southampton Locksmiths have been selected reliability and expert knowledge as well as a friendly and professional attitudes. Because providing excellent customer services as well as a competent locksmith underpin our philosophy or a quality service. So whether you just want a lock replaced or a key cut, or you want a master key system for a number of properties you will be assured of great service. Here at We Are Locksmiths, in Southampton, we believe that the protection and security of your house home or property our personal responsibility. When it comes to providing you with our expert locksmith services, you can rest assured that we complete the work on time, and at the price we told you. There are no hidden costs or excuses. Our locksmith Southampton Hotline is open 24 hours a day for emergency locksmith services, and we aim to be with you within the hour. We also agree a price on the phone prior to visiting so know what it will cost. 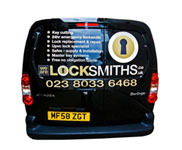 We Are Locksmiths Southampton could help to improve the security both inside and outside of your home or property. Upgrading or replacing locks on doors and windows, garages and sheds, safes and lockers. So if you are looking for a Locksmith in Southampton, then please call us on 02380 336 468 and we will be glad to help you.